Where did the day go yesterday?? If anybody sees a lost Tuesday running around, let me know, because I have no idea where mine went! On Saturday, I received a wonderful package from my Crochetville Secret Pal! 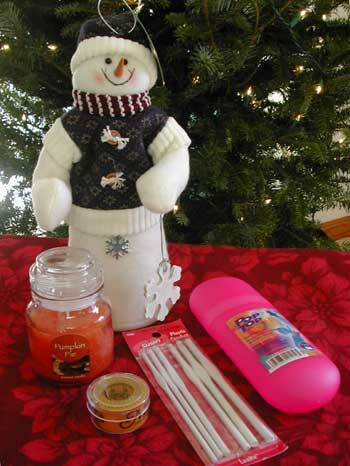 It contained a cute snowman Christmas decoration, a pumpkin pie scented candle in a jar, a tape measure, a set of Susan Bates plastic crochet hooks, and a pink Pop Top container (perfect for storing hooks!). Oh, Secret Pal, how did you know I keep misplacing my tape measure and crochet hooks? ;-) I have been enjoying the candle immensely the past few days. A candle with a festive scent really gets me in the Christmas mood. They’re holiday cheer for the nose! Question of the day: Do you think my dog can actually smell cheese when I’m eating it in the house and she is outdoors? I can eat all manner of foods without her caring much, but cheese produces a sad little face at the sliding glass door every time. Cute presents!! About the dog/smell factor: Absolutely. My dog can detect food smells from a mile away and he comes running to try to get me to share. It never matters what kind of food I have. Weirdly, his favorite is banana (something I extremely dislike). Hi Donna! Dogs can smell *through water* for up to a mile, I believe – that is how rescue dogs find remains in lakes. So I’m sure your pup can smell cheese even when the door is closed! Mine are all going crazy tonight, as DH is making homemade beef stock… their noses are in overdrive! Have a great week!